Some of us tend to think of Silver Needle as the sole purveyance of the Fujian Province in China (see an earlier article comparing versions). But is that just tea snobbery or tea ignorance or maybe even a bad tea experience? In my case it could be all three. Sigh! Fortunately, I am always eager to keep an open mind, learn new things, and give something a second try. In the case of a Silver Needle tea from India, it seemed essential. There was still stuck in my mind the question: Can you get a premium Silver Needle tea from India? Time to find out. 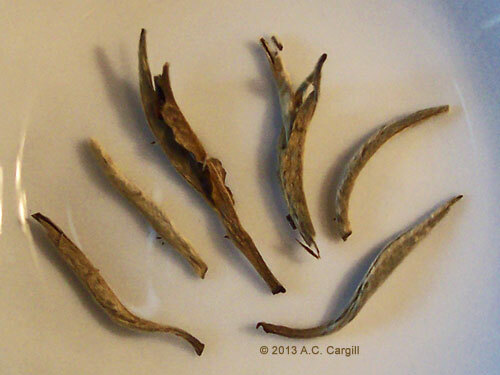 This variety of white tea is produced in the Fuding and Zhenghe areas of Fujian province. Many tea drinkers consider this the top grade white tea. To me, this indicates that similar white teas produced outside of the Fujian Province cannot truly be called “Silver Needle.” Also, it is one of the ten classic teas of China, so how could it possibly come from any other country? A photo posted online recently by a tea grower in northern India seemed to say that this was definitely possible. If the tea is really like it’s photo (and, knowing the grower, I see no reason it shouldn’t be), then there is definitely at least one grower producing a true Silver Needle in India. That, of course, means there are certainly others, and an online search bears that out. One vendor boasts a version from the Nilgiri state of India that, if it lives up to the web site photos, rivals those from Fujian. Another shows a version from the Manjushree Plantations Ltd. A host of other examples are readily found. Why fuss? Because there is a habit of late to slap a popular name on a tea so a higher price can be charged. Fake pu-erhs abound, becoming more rampant as knowledge of and demand for this type of tea increases. The name “Long Jing” or “Dragon Well” is now used for teas grown and processed nowhere near the famous well for which they are named. To combat this, I see more and more the “regionalizing” of various tea terms. “Pu-erh” can only be used for teas where the leaves and the production are done in Yunnan Province in China. “Darjeeling” is reserved for only those teas grown and processed in the state of Darjeeling in northern India. And so on. It seemed as if the term “Silver Needle” had been similarly hijacked as a way to charge more for an inferior version of this highly-prized tea. It also seemed as if some attempt was being made to make the term regionalized, that is, applied to a tea that had to be grown, harvested, and processed in Fujian Province in China. So far, that seems not to be the case. Nor, in my humble opinion, should it be. While I support the idea of protecting something special and not letting its reputation get downgraded by inferior versions, I am a supporter of open competition and keeping things simple wherever possible. Trying to get U.S. tea drinkers to see beyond the teabag is hard enough without making tea more complicated than it needs to be. 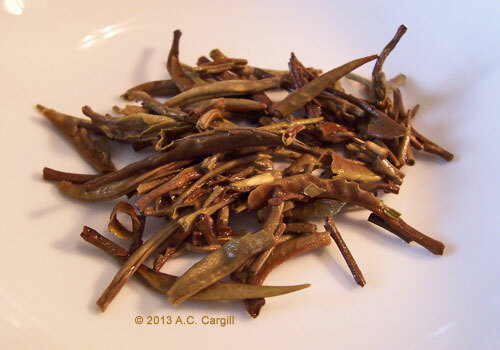 “silver tip white tea” — A fine example is Adams Peak White Tea from the Nuwara Eliya region of Sri Lanka (Ceylon). A hand-rolled tea grown at 7800-8200 feet above sea level that makes a delicate, light copper color tea with a taste of pine and honey. One of the few white teas from outside of China. “peony white needle” — An example is this version from the Chongqing Province of China. A delicate, lingering fragrance and a fresh, mellow, sweet taste. The leaves (two leaves and a bud combos only) come from a special varietal tea bush called Narcissus or chaicha bushes and must show a very light green almost gray white color and be covered with velvet peach fuzz down.. They are dried and withered in the sun. “white tips” — A tasty version is Darjeeling White Tips a very rare tea from the Darjeeling region where each leaf is hand selected, delivering a truly exceptional blend that has a wonderfully light scent. The flavor is muscatel with hints of white wine to deliver a truly wonderful finish. See what I mean? And all three are from outside of Fujian, China. No need to split hairs…uh, I mean, tea bud down here. As long as the quality is there, it makes no difference where the Silver Needle (or whatever name it’s being called) was grown and processed. And from what I’ve seen, the ones from India certainly meet that high standard. Chongqing Province is not in Fujian, China. It is a direct controlled municipality like Shanghai, Beijing and Tianjin. Bit of a typo there. Should have said all three outside of Fujian, China. Will correct. Thanks. For 150 years India produced conventional industrial cheap teas fit for tea bags and milk teas except export quality Darjeeling tea which normally no one wanted to drink in India thinking them as very weak teas..Bill Gates must be credited with speciality tea manufacturing crawl over Himalayas from China riding over the Internet and now everybody is making silver tips, golden buds, white, green, yellow and blue (oolongs) teas in India. Pu’er and flower teas are not copied because Steve Jobbs is no more there to help but soon as wild tea trees will be mature enough we will have pu’er in India too. I am just having one… a wonderful White Silver Needle from Doke tea gardens in Darjeeling. I had never thought Darjeeling would produce such an incredible white tea! I will next have to try it in the “Bai Mu Dan version” with the 2 lower leaves along with the bud.